by Brianna Crandall — February 4, 2019 — Sodexo, Inc., and Starship Technologies just announced the launch of robot food delivery services at George Mason University’s Fairfax, Virginia, campus. Mason’s 40,000 students, faculty and staff can now access the Starship Deliveries app (iOS and Android) to order food and drinks to be delivered anywhere on campus, within minutes, with a small cost for delivery. Blaze Pizza, Starbucks, Dunkin’ and 2nd Stop, a Sodexo-branded campus grocery store, are the first retailers to participate, with more to be announced in the coming weeks. 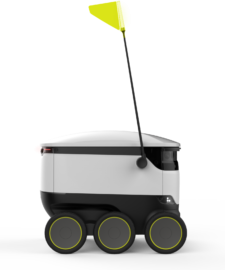 Starship robots deliver food, drinks, parcels and other items on corporate and academic campuses around the world. With a fleet of more than 25 robots at launch, this initiative is touted as the largest implementation of autonomous robot food delivery services on a university campus and is representative of Sodexo’s next-generation technology portfolio for the college and university market. Sodexo, a global provider of food and facilities management (FM) services, is committed to offering innovative services that help students enjoy a better campus experience. The service works in conjunction with student meal plans. By making food and drink more accessible, Sodexo and Starship are aiming to make the busy lives of Mason students, faculty and staff a little easier. We’re excited that our students, faculty and staff get to be at the forefront of this pioneering campus food delivery service. This will enhance life for everyone at the University, and that’s something we’re continuously looking to build upon. Our commitment to providing an optimal campus experience is one of the things that distinguishes George Mason University as a place where everyone can thrive. To get started, users open the Starship Deliveries app, choose from a range of their favorite food or drink items, then drop a pin where they want their delivery to be sent. They can then watch as the robot makes its journey to them, via an interactive map. Once the robot arrives, they receive an alert, and can then meet and unlock it through the app. The entire delivery usually takes 15 minutes or less, depending on the menu items ordered and the distance the robot must travel. Each robot can carry up to 20 lbs. — the equivalent of about three shopping bags of goods, notes Sodexo. College students understand the benefits of technology on campus and expect it to be integrated into their daily lives. Students and teachers have little free time as it is, so there is a convenience for them to have their food, groceries and packages delivered to them. Our goal is to make life easier, whether that means skipping the line, eating lunch on the lawn rather than in the cafe, or finding the time to eat better when studying for exams. Commuters can even meet the robot on their way into class. We look forward to seeing how our service will help and support the daily lives and community of students and educators at George Mason University. Starship Technologies provides autonomous delivery service and operates commercially on a daily basis around the world. Its robots have completed over 25,000 deliveries and travelled more than 150,000 miles. The robots use a combination of sophisticated machine learning, artificial intelligence (AI) and sensors to travel on sidewalks and navigate around obstacles. The computer vision-based navigation helps the robots to map their environment to the nearest inch. The robots can cross streets, climb curbs, travel at night, and operate in both rain and snow. In addition, the robots can be stored in pods located around campus where their batteries are automatically switched so they can continue to operate independently, with no human involvement. University dining programs are evolving their strategies to meet this generation’s elevated expectations, such as better quality, variety and service delivery. George Mason University’s culture of innovation and early adoption makes it the perfect campus for Sodexo and Starship to introduce this cutting-edge technology and enhance the campus experience for the entire school community. Being able to get food delivered to me within minutes is going to be fun and convenient. The lines can get long in between classes, and once you get a table at the library, you don’t want to give it up. Not only will this make my life easier as a student, but I’m going to get a visit from a robot! Those interested can follow Starship’s fleet of robots around the world online, or follow the GMU fleet at @StarshipGMU on Instagram, Twitter and Facebook, or view a YouTube video on the service, such as this one for the Intuit campus. For more information about Sodexo services or Starship technology, visit the respective websites. See which building service contractors are leading the way in service, safety and “cleaning for health” December 10, 2018 In "Developments » Industry Awards"